Provide comfort for the family of Morris Jacquez with a meaningful gesture of sympathy. 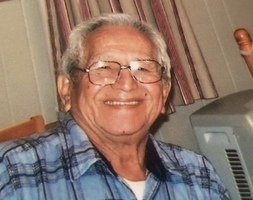 Morris Jacquez, 91, of Shinnston, passed away on Saturday, April 6, 2019 in Clarksburg. He was born April 7, 1927 in Lynch, KY a son of the late Francisco "Frank" and Candelaria "Stella" Alvarado Jacquez. Morris was preceded in death by his loving wife, Mary Lou Sandora Jacquez who died in 2004. He is survived by his brother, Samuel “Sam” Jacquez and his wife Helen of North Canton, OH; his sister, Virginia Radcliff and her husband Robert of Matthews, NC; a special niece, Maria Ganoe and her husband Donald “Doc” of Gregory's Run; and their children, Amber Ganoe of Shinnston; Matt Ganoe of Morgantown; as well as nieces, Linda, Laura, Rhonda, Rita, Denise, and Susan and nephews, Henry, Frank Joe, Brian, Frank W., David and Craig. Morris was also preceded in death by his brothers, Henry and Herman Jacquez; as well as his father and mother-in-law, Carmine and Pauline Ferris Sandora. He retired from Clinchfield Coal Company’s Martinka Mines in the late 90’s. In his earlier years, Morris could charm the crowd on a pair of roller skates. He was a servant to his family and dedicated his life to them. He viewed his neighbors as extended family and was always eager to lend a helping hand. No project was to big or to small for Morris’s attention. He would help his neighbors do anything from building a garage to weeding their flowerbeds. Morris will be sorely missed by his family and his Columbia Road neighbors. In lieu of flowers, memorial contributions may be made to the Dementia Society of America by mail to P.O. Box 600 Doylestown, PA 18901 or online at www.dementiasociety.org/donate. The Perine Funeral Home is honored to serve the Jacquez family. To send flowers in memory of Morris Jacquez, please visit our Heartfelt Sympathies Store. 1359 S. Pike St., 1359 S. Pike St. Provide comfort for the family of Morris Jacquez by sending flowers.